AFC Fylde manager Dave Challinor insists his players won’t be getting carried away despite climbing into the National League play-off zone. Their comfortable 3-0 win against Maidstone on Tuesday night means the Coasters are now in their highest ever position in the club’s history, as they sit proudly in sixth place. Fylde are on a stunning run of form, having won six out of their last seven games, drawing the other, but Challinor is refusing to get too carried away. He told The Gazette: “The players have been looking at the league table all year and have been frustrated by how we’ve stayed in the same sort of position for so long. “But for me it’s always been about accumulating as many points as we can and then seeing where that takes us. “That won’t change and our mindset will stay the same, even though we’re now up into the play-offs. But we continue to look upwards and we want to stay in there. “No-one is running away with it and anyone can beat anyone in this league. You look at Macclesfield and they’ve got some tricky fixtures coming up in Tranmere and Aldershot. 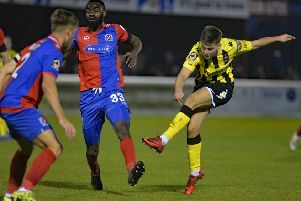 Fylde have been in free-scoring form in the last week, netting nine times in two games, but it is the Coasters’ form at the other end of the pitch that has pleased Challinor the most. He added: “We have been free-scoring for a number of years but for me the most pleasing aspect of our recent displays has been our defensive solidity. “We’ve managed to pick up quite a few clean sheets along the way, which can only help. Fylde make the trip to Woking this weekend, a side that have failed to win in their last 12 games. “It’s a tough place to go and they beat us here earlier in the season,” Challinor said. “I know they’ve not been in great form recently but I expect them to kick into gear soon. “They’re on a bad run but look at the games they’ve been involved in – they narrowly lost to Tranmere and Aldershot, so their performances haven’t been too bad. Fylde’s Lancashire FA Senior Cup quarter-final at Oldham has been rearranged for Tuesday next week at 1pm.